working on my own. 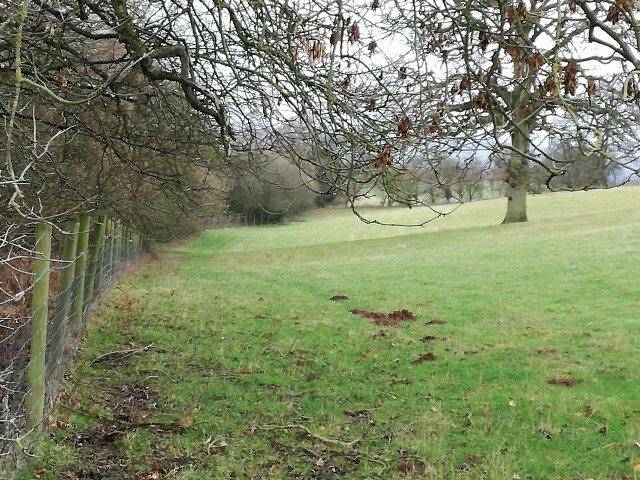 The nearest point of the hedge was over 300 metres from any road and if the weather was wet then I could not drive over to the site without making a mess. 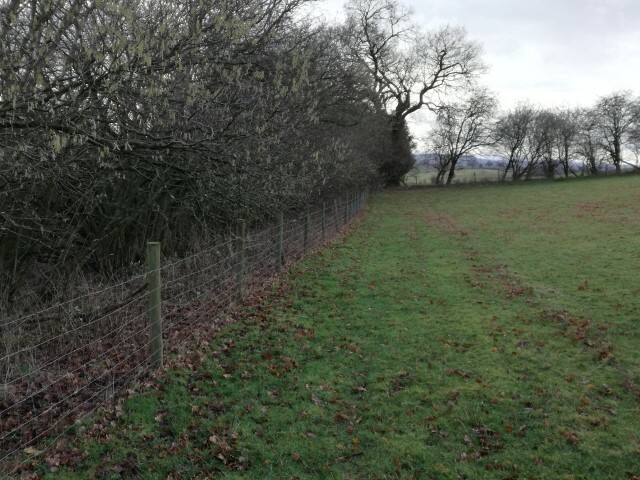 The first job was to remove the existing fence. parts as the hedge had grown through the fence. 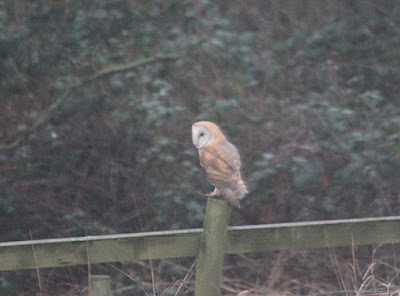 using it again on another fence on the farm. 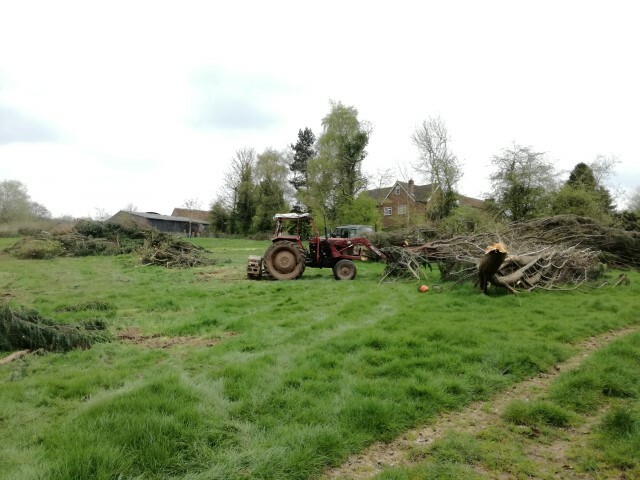 After a few days the fence had been removed the next stage is to start felling the trees. 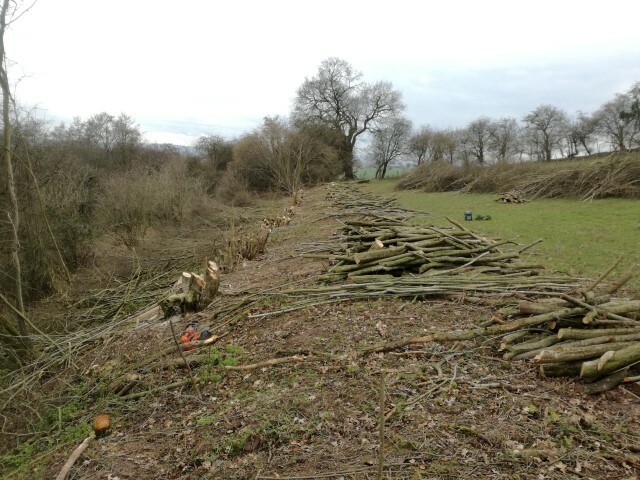 This was a bit daunting to say the least as it was a long length to do by the end of March! 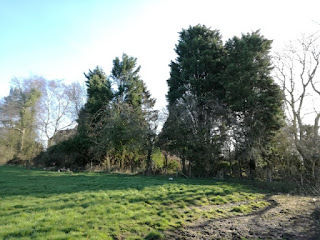 It was important to try and keep the site relatively tidy and organised. Brash had be pulled away by hand to leave a gap wide enough for a vehicle to pass as well as ensuring the line of a new fence was kept clear. 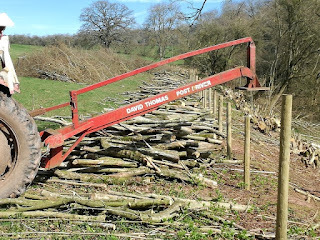 The timber that was large enough to keep was roughly stacked to be collected later. 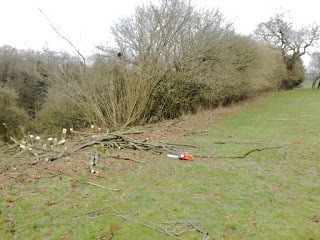 Whenever possible several mature trees were left along the line of the hedge for wildlife. 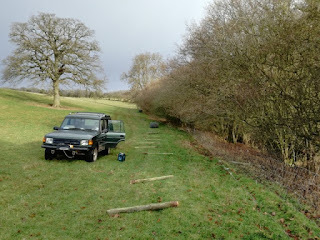 I was lucky enough to have a winch on a vehicle which was extremely useful. 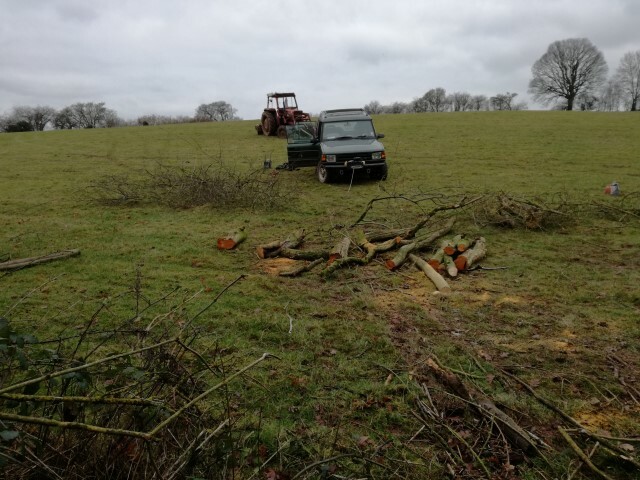 When using the winch extreme care had to be taken due to the slope where work was taking place. The winch has a potential capacity to pull 5 tons. The potential forces this can generate is very dangerous and there are numerous ways an accident can happen very quickly. The winch vehicle was attached to a tractor using two straps. A very useful feature on the winch is the remote control so the winch can be operated from a safe distance. 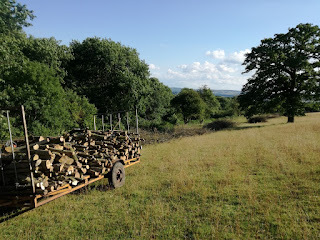 The other side of the hedgeline was a steep slope so wood could be pulled up from the other side.. 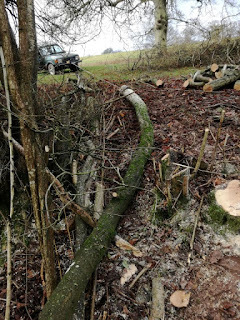 I could attach the winch rope to a tree and then once I had cut a v section out of the bottom of the tree I could stand back and let the winch do the work! 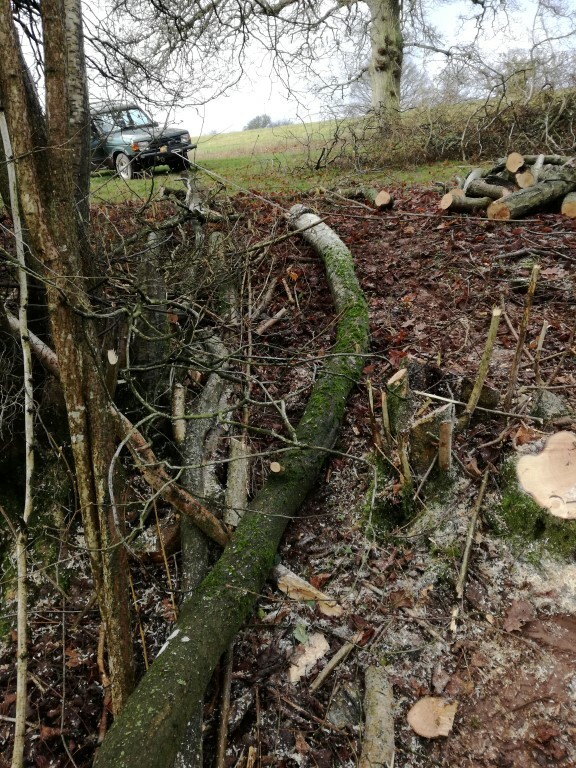 The winch would not only pull the tree the right way safely (with me out the way) it was able to pull the tree out of the branches of next tree along as well as then safely pull out the tree out into the field where I could chainsaw it safely. 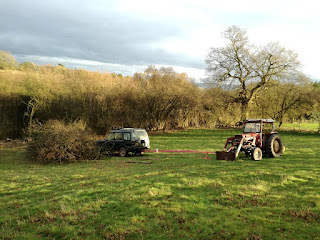 The winch was absolutely brilliant and made the job a so much more easier and safer for me to do the job on my own. It is a mid range 13000 lb (5 ton pull) remote control winch made by winchmax. I have had it for about 7 years and once in a while it has been extremely useful. 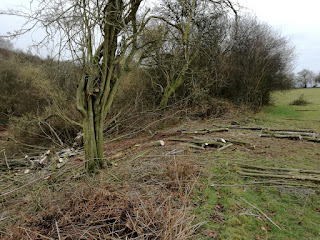 I did have my doubts on whether it is was up for this coppicing work but was very pleasantly surprised to find out how good it was going to be. After the felling of the trees had been done the next stage was to fence the hedgerow. 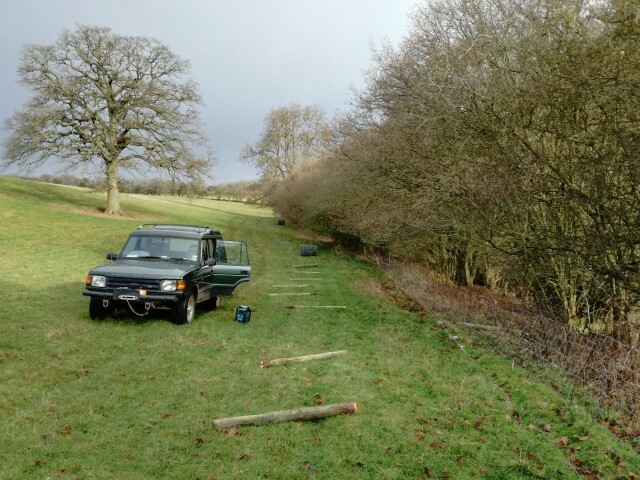 The new line of the fence had to be established and the posts then laid out and driven in. 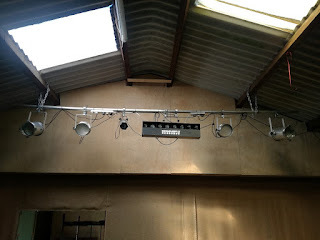 Once the posts had been all completed the wire then had to be attached and tightened. After the coppicing job it was straight into the next one. The next project was to remove several large trees that were dangerous around the farmhouse garden. 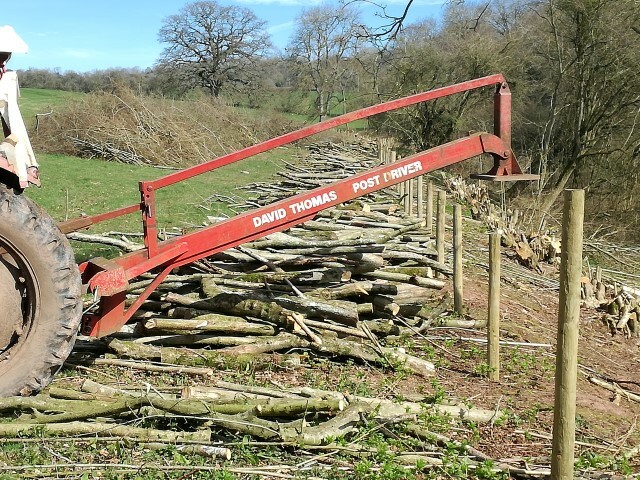 A professional tree feller was used due to the size of the trees. 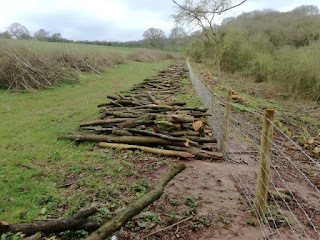 This again was a huge job and had to be completed before the cattle were put on the farm in late April. So pressed on and managed to achieve the removal of all of the wood and to reinstate the garden fence all in the nick of time! It is always a small window in May when the Bluebells are looking their finest on the farm and also you have to choose a good day AND a good time to photograph them. 2017 was a particularly good year and I was lucky enough to get some reasonably good photos. 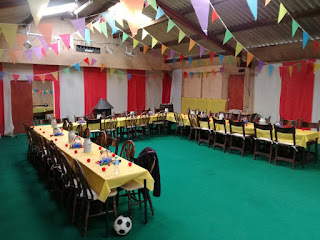 We have a party barn and my little boy had a birthday coming up so we threw a fantastic party for him at the farm. 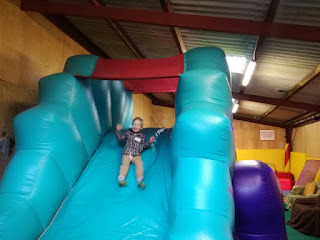 The first one that he was allowed to have lots of his buddies around.He loved it! 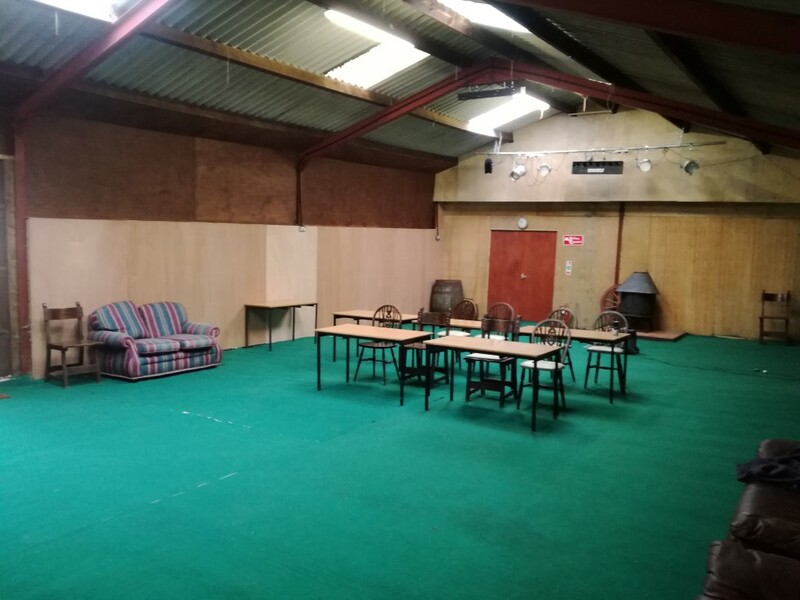 Later on in late Spring one or two improvements were done in the barn which included facing a wall with wooden panels and to replace some carpet for the floor. The lighting system was stepped up too and there are now more lights and also a control board set up behind the bar. A new large fridge has been a welcome addition as well as a new false roof above the bar. This season we have had some interesting parties and themes and a lot of effort was put into the decorations. 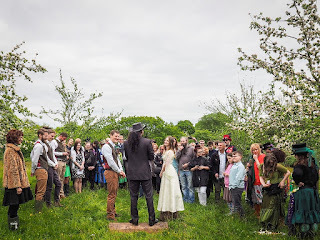 We had several 'Handfasting' ceremonies on the farm which were really imaginative. 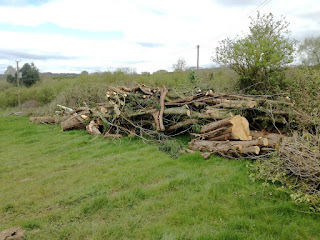 Well aware that I had a vast amount of firewood now lying out in the fields that needed to be collected I had to have some sort of a plan in storing it properly back at the farm. Once the barn was cleared the next task was to undertake the huge mission of collecting all of the wood from the coppicing I had completed in March to bring back to the farm. 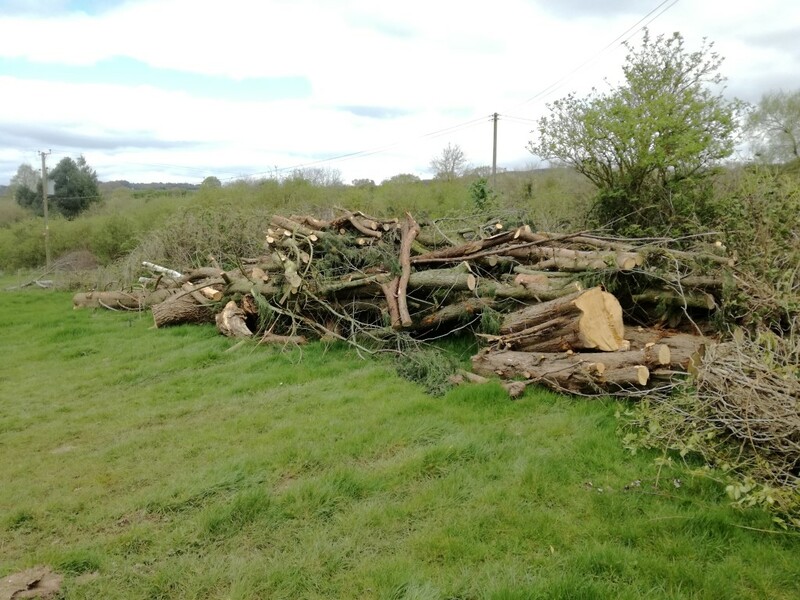 This was a bit daunting to do all by hand on my own but firewood is an important harvest for us and with all farming jobs you just have to get on with it! The site also needed to be dry in order for me to access the wood without damaging the ground and getting stuck! 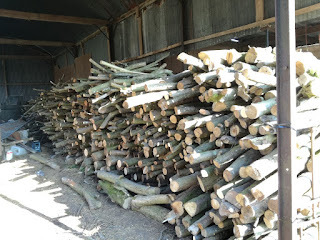 I cut the wood in 6 - 7 foot lengths when I was doing the hedgework which were then relatively easy to load, transport as well as unload and stack properly in the barn. 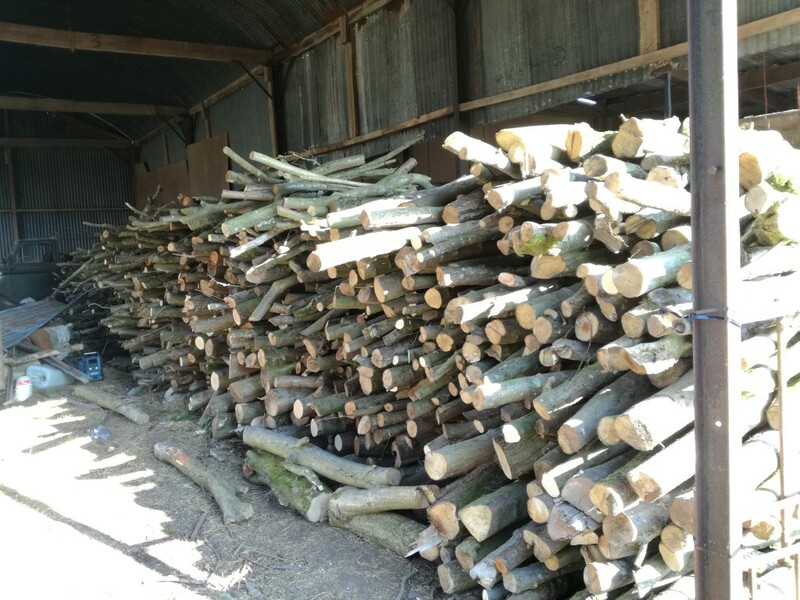 Once done it was satisfying to have this sort of amount of wood in storage for the next few winters! This year we did slightly less shows during the summer but a few more in the Autumn and Winter. We were quite pleased overall with the results looking back on the results. 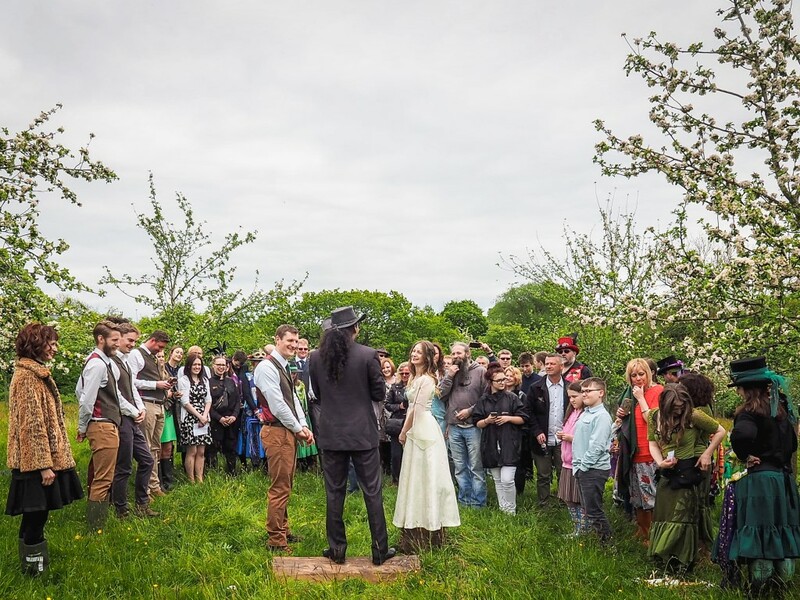 I did originally fear that the whole food festival boom was waining but this could be the fact that we chose the ones that we knew have previously done OK. New ones included both the Autumn Show and Christmas Festival at Dudmaston Hall which is a National Trust Property near to Bridgnorth. 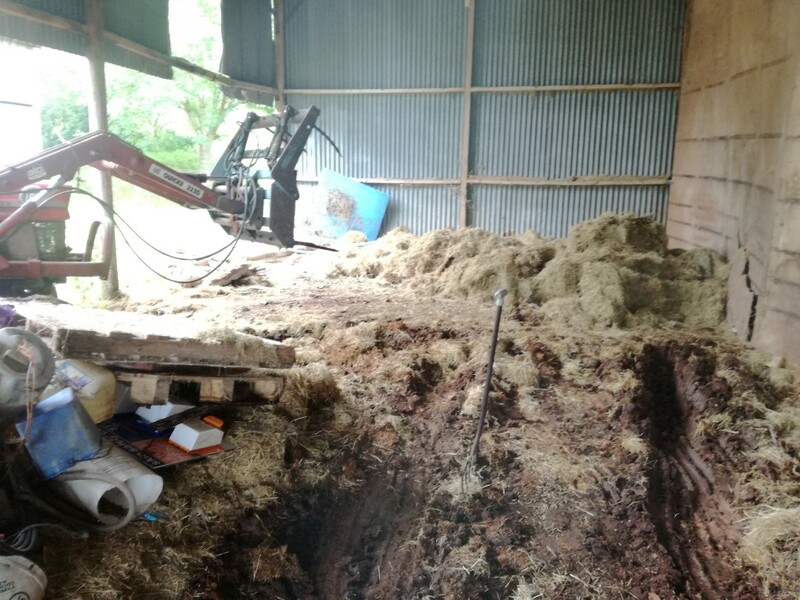 After a lovely week on holiday (a great break) in ealry winter when we arrived back there was 4 tons of apples in the apple bunker that had been delivered and waiting to be pressed! Not a bad year at all and we managed to finish cider in late November just in time before the Christmas Food Shows got under way. 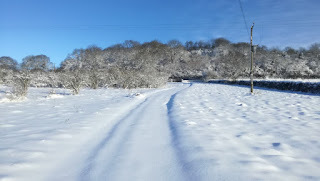 December we saw a significant amount of snow. Early December was when it happened and I was quietly chuffed that I had bought a 4 wheel drive vehicle in November so I felt I was prepared! 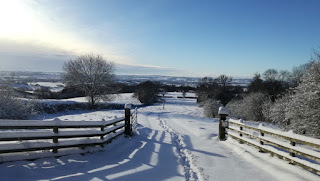 One problem is that we were due to exhibit at Shrewsbury Christmas the very weekend it was forcast for snow. 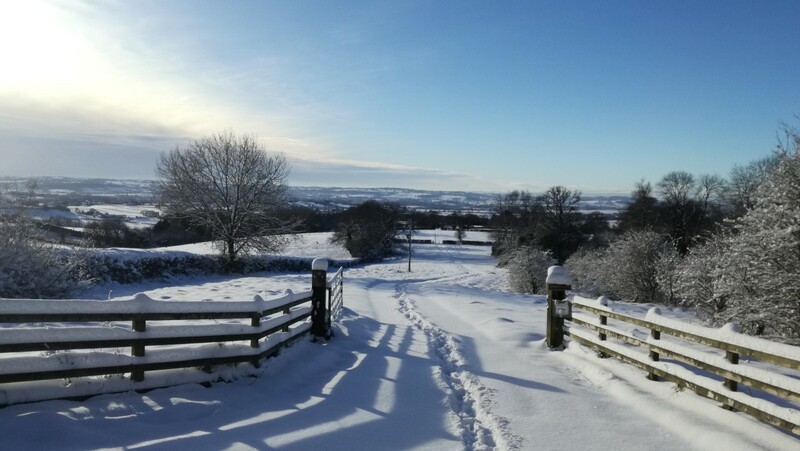 We had to turn back on the Friday which we were due to set up for the show as the main road up to Shrewsbury was starting to white over and become dangerous. Loaded up my 'new' 4 wheel drive with the bare essentials of doing the show for a day and left early on Saturday morning to set up and do the Saturday at the show. . 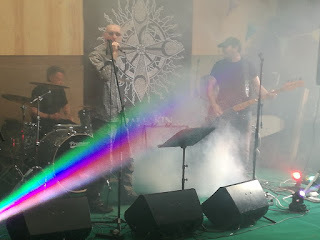 The forecast for the next day (Sunday) was awful so we reluctantly had to decide to not attend on the Sunday and packed up on the Saturday night. 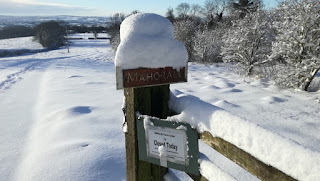 This was just as well as we had a significant snowfall on the Saturday night. This is of course significant as we have half a mile of private drive (which is impossible to clear the snow properly) and then coupled with the last stretch of drive being a hill which leads straight onto the public lane. Looking back 2017 has been a busy year and a pretty good one.